Deputy Minister for Foreign Affairs of Canada, Daniel Jean, addresses the general debate of the General Assembly’s seventieth session. The Deputy Minister of Foreign Affairs of Canada, Daniel Jean, addressed the United Nations General Assembly today, noting the importance of the new sustainable development agenda and of ensuring the proper financing of climate change mitigation and adaptation efforts. Mr. Jean said that Canada is proud to support, “in word and deed,” the commitments in the 2030 Agenda. The Organization – and the international community it represents – deserves our praise for aiming to eliminate poverty on a global scale. He also spoke about the need to promote “fundamental freedoms” and the rule of law in parts of the world where these were absent. Turning his attention to Canada, he said his country has identified maternal, newborn and child health as development priorities, and has committed $3.5 billion to support this over the next five years. Speaking on the issue of climate change, he said that Canada was working with all parties under the UN Framework Convention (UNFCCC), in order to reach agreement at the upcoming conference in Paris. “For Canada, an effective agreement must address both mitigation and adaption,” he said, adding that his country, by 2030, aimed to reduce greenhouse gas emissions by 30 per cent below 2005 levels. He also noted that financing would be a key part of the discussions, and said that Canada had already pledged $300 million to the Green Climate Fund, in addition to a prior investment of $1.2 billion under Fast-Start Financing, which has supported climate related projects in over 70 developing counties. 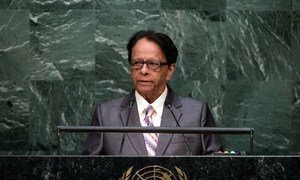 Leaders from, small island States took their turn at the podium of the United Nations General Assembly today to call for the strengthening of cooperation between international organizations in solving global crises, from resolving conflicts to tackling climate change.